. : Optics & Photonics Focus :: EPS QEOD Thesis Prizes: The Winners of 2011 :. How close are we to the quantum computational revolution? Current precursors of quantum computers cannot be scaled efficiently. Now, researchers have realized a new setup that can be scaled more easily than ever before. Until recently, quantum behavior seemed to be the exclusive domain of tiny objects like atoms or electrons. However, entanglement of millimeter-sized membranes may soon come about, thus bringing quantum physics closer to our macroscopic world. What a wonderful world it is when looked at from the perspective of a microscopic particle! All at once, a whole lot of small things take on new importance – not least so, the behavior of the electric charges around the particle. Six promising young scientists have received the prestigious QEOD Thesis Prize, awarded by the Quantum Electronics and Optics division (QEOD) of the European Physical Society (EPS), for their fundamental and applied work in optics and photonics. The ceremony took place at the CLEO/Europe-EQEC meeting in Munich, in May2011. Congratulations! The 2011 QEOD Thesis Prize winners. (top row from the left) Maiken Mikkelsen, Simon Gröblacher and Albert Schliesser. (bottom row from the left) Pavel Ginzberg, Alex Hayat and Alberto Politi. Tuesday, May 24th 2011. 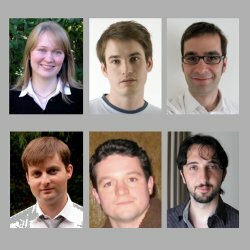 Six promising young scientists working on fundamental and applied aspects of optics and photonics are presented with the prestigious QEOD Thesis Prize, in a ceremony held as part of the Conference on Lasers and Electro-Optics (CLEO) Europe, during the last World of Photonics Congress in Munich, Germany. The novelty this year (2011) is that, in addition to excellent research work, the candidates were asked to submit a summary of their work in the style of an Optics & Photonics Focus article; their communication skills, therefore, also come into play. It is with great pleasure that Optics & Photonics Focus joins the Quantum Electronics and Optics Division (QEOD) of the European Physical Society (EPS) in congratulating the winners on their outstanding research work and also for their excellent communication skills. Well done! Here, we publish some short abstracts of the winners' achievements. Each abstract is followed by a link to the summary each winner submitted. A micromechanical oscillator. A microtoroid made of glass, with the diameter of a human hair, hosts, simultaneously, very high quality optical and mechanical modes. A laser coupled to its optical modes can be used to detect mechanical displacements at the attometer level. At the same time, its radiation pressure acts on the mechanical mode, and can be harnessed to cool its motion down to levels close to the quantum ground state. Optical forces have been harnessed to cool the motion of atoms and ions down to a regime where this motion can only be understood in quantum mechanical terms. In contrast to atoms and ions, larger mechanical systems are still considered to be completely classical objects. Silica microscopic toroids are a particularly interesting example: not only are they mechanical resonators capable of vibrating at very well defined frequencies, but they can also trap a huge amount of light in their tiny volume. Indeed, light can travel around their rims millions of times before escaping and it can, therefore, exert a significant force, which can alter the dynamics of the mechanical vibrations of the microtoroid. This dynamical back-action of light was predicted by Russian theorist Vladimir Braginsky some time ago, but it eluded experimental observation for over three decades. Under certain conditions, dynamical back-action can reduce the random thermal agitation of the mechanical oscillator’s displacement, effectively cooling this individual degree of freedom. Albert Schliesser was able to demonstrate this effect by using silica microtoroids and he was also able to cool down to the quantum regime the mechanical oscillations of the microtoroid. 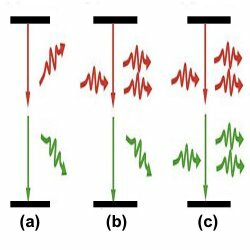 Single-electron spin dynamics. (a) Characteristic Kerr rotation feature indicating a single spin-polarized electron. (b) Single spin precession in a magnetic field. Kerr rotation amplitude refers to the height of the feature in (a). (c) Single electron spin rotation as a function of intensity of the control pulse. Adapted from Nat. Phys. 3, 770 (2007). In spintronics, or spin-based electronics, information is carried by the electron spin, instead of the electron charge like in standard electronics. While the charge is a classical property that can only take a value of “0” or of “1” (a bit), the spin is a quantum property that can be in the “up” or “down” states (corresponding to the “0” and “1”), but also in a quantum superposition of the two (a quantum bit, or qubit). 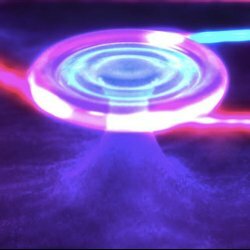 Because of this additional degree of freedom, spintronics holds the tantalizing promise of super-fast quantum computers and truly secure communication. However, for this vision to become reality, we need to be able to reliably initialize, read and update spin states; furthermore, this must be done within ultrafast timescales, before the spin-information is lost as a result of interactions with its surroundings (quantum decoherence). 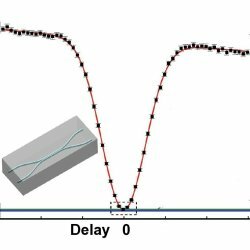 Maiken Mikkelsen’s experiments have demonstrated how a promising qubit candidate — a single electron spin confined in a semiconductor quantum dot — can be initialized, manipulated and detected at ultrafast time scales. While quantum mechanics is one of the most successful physical theories to accurately describe effects such as superconductivity and Bose-Einstein condensation, most of its predictions are somehow counter-intuitive and at odds with our intuition. The way we experience the world on a day to day basis relies on processes that occur at a macroscopic scale, approximately starting at the size of a dust particle. Most quantum effects, in contrast, are typically only observed on a microscopic scale and involve far fewer particles. However, the quantum theory does not, in itself, pose any limits to the size or the mass of a system in which its effects should be observable. Scientists have been trying for decades to demonstrate quantum behavior on ever-bigger physical systems, in order to answer fundamental questions such as: Why is the world around us classical and not quantum? Is there a size- or mass-limit in order for these systems to behave according to quantum mechanics? Is the quantum theory complete, or do we need to extend it? Simon Gröblacher’s experiments studied a mechanical oscillator –ranging from hundreds of microns to a few tens of microns, (just enough for it to be visible to the naked eye) — coupled to an optical resonator. Such system is truly macroscopic when compared to standard systems used in quantum experiments – it consists of up to 1018 atoms and has a mass of a few tens of nanograms. The vibrational motion of the mechanical oscillator interacts with the optical cavity mode via the radiation-pressure force, where both the dynamics of the mechanical oscillation and the properties of the light field are modified through this interaction. Gröblacher was able to cool the mechanical oscillator down to near its mechanical quantum ground state, and to study the correlations that emerge between the mechanical and optical systems, setting the foundations for creating and controlling quantum states of truly macroscopic systems. A directional coupler. The rate at which the photons are detected at each output of a directional coupler is a function of the delay between the arrivals of the photons at the coupler. The inset represents a schematic of a directional coupler in silica. Quantum information science aims to harness quantum mechanical effects and to develop systems that will deliver significant improvements in information processing and security over their classical counterparts. 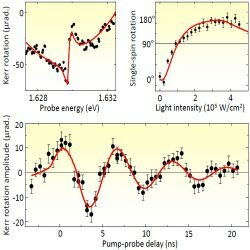 Since single photons are excellent models for qubits, due to their very low intrinsic noise, the fact that they travel at very high speed and the fact that they are relatively easy to manipulate, the field of photonics looks quite likely to take on a central role in the development of this type of technology. However, until recently, quantum photonic systems were composed of discrete, bulky parts — such as lenses, prisms and mirrors — which led to severe limitations in miniaturization, scalability and stability. The development of integrated quantum optical circuitry has removed this bottleneck, enabling the realization of much more complex and compact schemes. Such schemes require a network of optical waveguides where photons can travel and interact in a quantum manner. Alberto Politi’s work focused on experimentally demonstrating the feasibility of some key requirements for the implementation of such integrated quantum photonic circuits. In particular, Politi has demonstrated that in a coupler between two waveguides, the quantum properties of the traveling photons can be preserved, and that the phase of the photons can be controlled by thermo-optical effects. Furthermore, Politi has demonstrated the implementation of some simple quantum algorithms (for example, Shor’s algorithm for the factorization of numbers) on an integrated waveguide circuit. These results provide fundamental building blocks from which future quantum devices could be constructed. 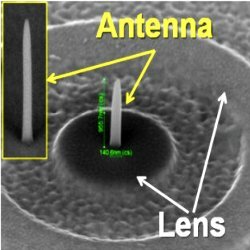 Coupled nanoantenna and plasmonic lens. Rings, etched in a gold film, act as a lens redirecting free-space light waves into focused propagating surface plasmon polariton (SPP) waves. The waves efficiently excite the vertical antenna (inset) and nano-sized hot spots appear at its apex. Microelectronics was arguably the star amongst 20th century technologies, managing to produce devices with extremely high speeds and a great number of integrated components. However, the contextual increase of their power consumption and associated heat dissipation limits the increase of the speed of microelectronics to some gigahertz. Luckily, photonics may be able to come to the rescue; indeed, photonic components may operate at extremely high speeds (dozens of terahertz) with negligible power loss. A possible interface between electronic components and photonic devices is based on plasmonic circuits and metamaterials. Pavel Ginzburg has demonstrated, both theoretically and experimentally, how light can be confined down to nanoscopic volumes, an essential step towards the coupling of photonics to electronics. Furthermore, he studied new types of plasmonic particles that could well serve as building blocks for novel metamaterials. Diagrams of two-photon emission (TPE). (a) Transition diagram of spontaneous TPE. (b) Singly stimulated TPE (c) Fully stimulated TPE (TPG). Semiconductor devices have changed our everyday lives. For example, the invention of the transistor more than half a century ago sparked a revolution that pushed out the cumbersome and energy-wasting vacuum tubes and kick-started the information age. More recently, compact semiconductor LEDs have been replacing the incandescent and fluorescent lamps used to provide light. Light sources, however, are much more than mere sources of light; for example, compact semiconductor lasers are employed in fiber-optical communications, and ultrafast laser pulses are employed to characterize physical and chemical processes that are too fast to be seen with any other means. Until now, ultrafast light sources for quantum applications were based on bulky and energy-consuming systems, which must be pumped optically with intense laser pulses, thus limiting the widespread use of these applications. By discovering a novel process of two-photon emission in semiconductors, Alex Hayat has realized ultrafast light sources for quantum applications in compact electrically-driven LED-like semiconductor devices; this could well prove essential in future quantum circuitry.